A suspected meteorite explosion recorded over the northern Russian city of Murmansk on April 19, 2014 (local time). Russians may be forgiven for thinking the sky is falling. 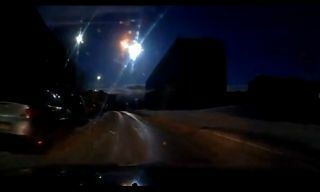 A super-bright meteor exploded over the northern Russian city of Murmansk early Saturday morning (April 19), a little more than a year after another airburst lit up the skies above Chelyabinsk, about 1,300 miles (2,090 kilometers) to the southeast. "Most observers identified the object as a meteorite, though officials have neither confirmed it nor said where the fragments are likely to have landed," the Russian news outlet RT News reported Saturday. "Others speculated that the object may have been space debris, re-entering the atmosphere." The explosion caused no injuries on the ground, RT News added. That's in contrast to the Chelyabinsk event, which wounded about 1,500 people on Feb. 15, 2013. The Chelyabinsk fireball served as a wakeup call, many scientists say, alerting the public and policymakers to the dangers posed by near-Earth asteroids. Millions of these space rocks are thought to cruise through Earth's neighborhood, but researchers have spotted and tracked less than 11,000 of them to date. The Murmansk and Chelyabinsk events shouldn't be taken as a sign that Russia has angered the heavens in some way. Russia is the largest country by land area in the world, so it naturally absorbs more asteroid strikes than any other country.